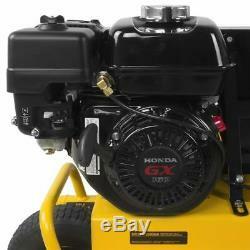 DeWalt 5.5-HP 8-Gallon (Belt Drive) Gas Wheelbarrow Air Compressor w/ Honda Engine. Honda GX160 Commercial Grade Engine. 5.5 HP engine is powerful, reliable & easy to start. Durable Cast Iron Twin Cylinder Pump. Custom pump shroud provides directional air cooling. Swedish stainless steel reed valves for optimum longevity. Delivers improved filtration & sound dampening. Fully Enclosed Metal Belt Guard. Covers & protects moving parts; provides operator safety. Liquid filled tool & tank gauges for more accurate readings. 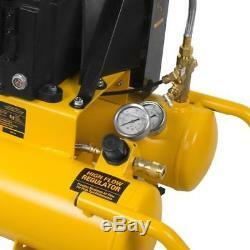 High flow regulator allows maximum air flow for peak tool performance. Quarter Turn Tank Drain Valve. Quick & thorough tank draining prevents rust. Center mounted for easy mobility at job sites. Thick Vibration Isolators On Tank Feet. Controls vibration & helps prevent crawling. 3 years on engine; 2 years on pump; 1 year all other parts. Power Equipment Direct was founded on the premise of simplified shopping. Customers could sort through all of the leading power equipment products online from the comfort of their homes - no traffic jams, no crowds, no scratched tailgates. Founder Jon Hoch, launched his first web store from his basement in 2003. Several years and a couple of web stores later, Power Equipment Direct is one of the leading online power equipment e-tailers with millions of dollars in annual sales. The company owns more than a dozen power equipment-related web addresses and plans to open more specialty superstores in the very near future. Exceptions include some handheld lawn tools. Boxes or APO/FPO addresses at this time. Each item which this applies to, will contain information in the respective listing description information. Thank you for your time and understanding regarding this topic. In some rare instances, you may need some help with a return. Simply contact our Customer Service team in order to discuss return options for unopened merchandise. Simply contact our Customer Service team in order to discuss return options for opened merchandise. If the product has been gassed or oiled, it needs to be taken to an authorized service center. Concealed damage claims must be reported immediately. On occasion, the outer carton may look damaged, but the product inside the box is perfectly fine. Do not sign for damaged products. If you think your product is defective, don't worry. They have expert technicians standing by to help solve your issue. Please have your model number and serial number available for fastest service. And we will respond within 24-48 hours. Customer Service hours of operation are 7am - 7pm CST, Monday - Friday. This listing is currently undergoing maintenance, we apologise for any inconvenience caused. 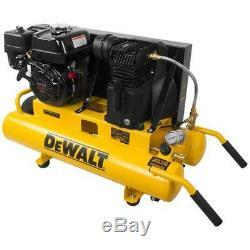 The item "DeWalt 5.5-HP 8-Gallon (Belt Drive) Gas Wheelbarrow Air Compressor with Honda E" is in sale since Wednesday, February 17, 2016. This item is in the category "Home & Garden\Tools & Workshop Equipment\Air Tools\Parts & Accessories". The seller is "powerequipmentdirect" and is located in Bolingbrook, Illinois. This item can be shipped to United States.